Based on a once in a lifetime relationship with her dog Jettie, combined with her Engineering background, Elicia Calhoun has developed a unique and successful approach to the sport of Dog Agility. In her view, the Dog and Handler should be “One” on the course. Elicia likes to say: “The Handler is basically Dancing with their Dog, as they move and communicate to create their own rhythm and dance.” Watch her flowing style when she is on course and you will understand! Elicia has been teaching Dog Agility for the past 26 years which she both enjoys and is extremely effective. She is highly energetic and enthusiastic individual who has a way of explaining things in a clear and simplified manner. As well as being a Professional Agility Instructor, former USDAA Judge, and author, Elicia is also one of country’s top competitors. Her most notable achievements include: Three time world Champion, Five time National Champion and multiple time Regional champion and 22-time National Finalist. 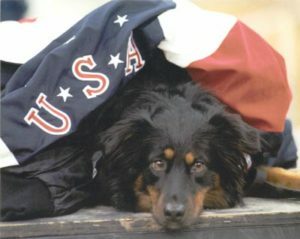 Elicia and her dogs have represented the United States for 26 different teams at World Championship Competitions. And, her dogs, Suni, Tobie, Nika, BreeSea, Iceman and Jettie, have numerous awards and titles in AKC, UKI, USDAA, and NADAC. So, whether you want to ‘Do the Dance’ as a means of recreation or are a serious competitor looking for new challenges, Elicia is worth investigating!